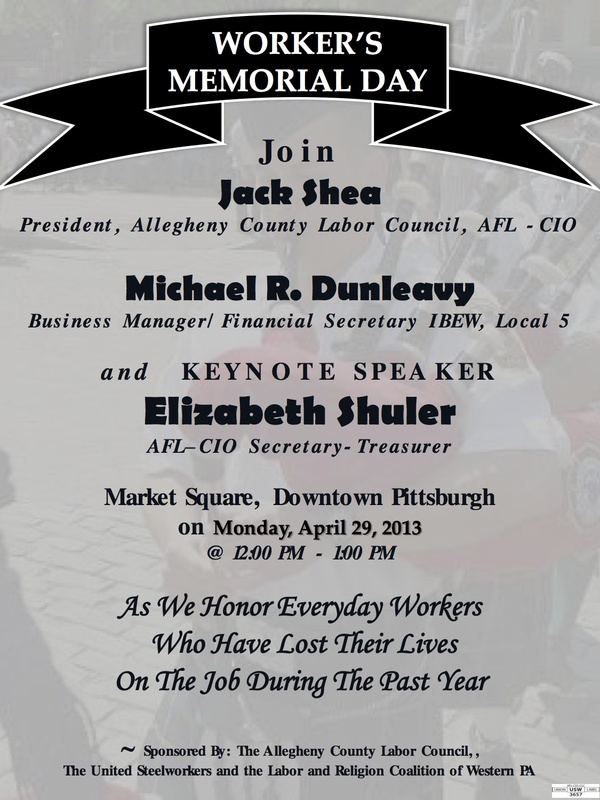 Join USW Local 3657 this Workers’ Memorial Day to remember the workers who lost their lives on the jobs and fight like hell for the workers who are still struggling to win safe workplaces. Every year in April, the unions of the AFL-CIO observe Workers Memorial Day to remember those who have suffered and died on the job and to renew our efforts for safe workplaces. This year the struggle continues to create good jobs in this country that are safe and healthy and to ensure the freedom of workers to form unions and, through their unions, to speak out and bargain for respect and a better future. It’s time for our country to fulfill the promise of safe jobs for all. Four decades ago, Congress passed the Occupational Safety and Health Act, promising every worker the right to a safe job. Unions and our allies have fought hard to make that promise a reality—winning protections that have made jobs safer, saved hundreds of thousand of lives and prevented millions of workplace injuries and illnesses. Many job hazards are unregulated and uncontrolled. Some employers cut corners and violate the law, putting workers in serious danger and costing lives. Workers who report job hazards or job injuries are fired or disciplined. Employers contract out dangerous work to try to avoid responsibility. As a result, each year thousands of workers are killed and millions more injured or diseased because of their jobs. The Obama administration has moved forward to strengthen protections with tougher enforcement and a focus on workers’ rights. But much-needed safeguards on silica and other workplace hazards have stalled in the face of fierce attacks by business groups and the Republican majority in the U.S. House of Representatives who want to stop new protections.